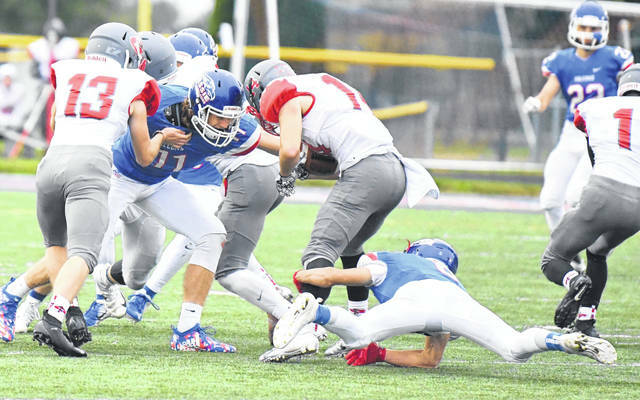 Brice Seaman (lower right) and Tate Olberding (11) go after a Goshen ball carrier during last week’s game at Frank M. Irelan Field. Clinton-Massie’s 21-2 win over Goshen in Week 8 had many layers. The game was stopped on Friday and resumed Saturday when Clinton-Massie fan Jamie Parsons passed away in the stands. The SBAAC American Division contest was the first for Massie without head coach Dan McSurley, who missed the game with a leg injury. This week the Falcons travel to New Richmond with a chance to clinch a share of the American Division crown with a win. Kickoff is set for 7 p.m.
Massie is 7-1 overall, 3-0 in the conference. The Lions are 6-2 overall, 2-1 in the American. The Lions lost to Western Brown in what could be considered an upset last week, 22-14. It put the Lions in must-win mode if it wants to share a league crown and/or to make the playoffs. Without McSurley on the sidelines, the Falcons were the same old Falcons, grinding out 310 yards on the ground and squashing the Goshen offense to the tune of just 98 yards. Zantene said the coaches are in regular contact with McSurley. Otherwise it’s business as usual for the Massie coaching staff.